Orlane Paris is always seeking perfection and higher performance in their skin care to meet the needs of the modern woman. 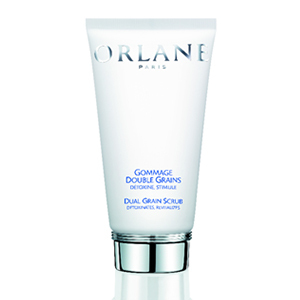 Our NEW Orlane Dual Grain Scrub is more than a simple exfoliation. The Dual Grain Scrub uses an exclusive combination of volcanic grains and rice grains of two different sizes ensuring a double polishing and exfoliating action. Immediately the skin regains its softness. The appearance, released from its impurities, regains radiance, freshness and luminosity. Allows a better preparation on the skin for the skin-care. Massage very gently on wet skin avoiding the eye area, rinse thoroughly. For combination and oily skin, scrub 1 to 2 times a week. For normal and dry skin, perform the scrubbing every week or every ten days by massaging the skin gently.